Before rushing to begin our Mt. Kilimanjaro trek, we first had to enter East Africa. We’d become quite accustomed to the tribal , Bantu, rhythms of Southern Africa, its culture and speed. 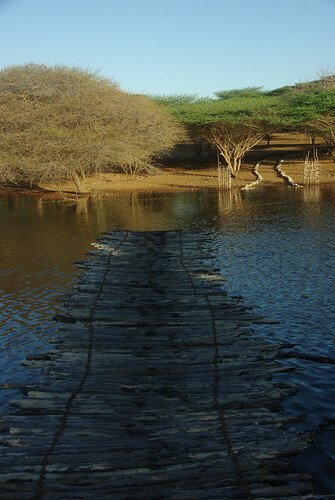 Then we crossed into Tanzania and everything became a bit different. We were now in the land of the Swahili traders. Tanzania itself is a complete mixture of these two cultures, Bantu, or indigenous African groups, and the Swahili tradesmen who came down the coast around 2,000 years ago. When the colonial powers finally left Tanzania there were actually two nations here: Tanganyika on the mainland and Zanzibar at sea, which were quickly united in one new African democracy- Tanzania. I personally wasn’t quite ready to Dar Es Salaam, which literally means “Haven of Peace”. Gone was the culture I’d gotten used to and instead there was Mosque after Mosque after Mosque. The city was a huge mess, about what we expected there, but it was clear from the start that Swahili was the language and not English (even though both are official languages) and we were far more foreign than we’d been at any point in our trip thus far. All this change didn’t come without its benefits though. Every restaurant we’ve been to has hand washing stations, thanks to the Muslim influence. Occasionally this is even provided at the table by the waiter or waitress, holding a pitcher of hot, soapy water over a bowl…you don’t even need to get up to wash. There is good quality street food again, much of it prepared according to Hallal directives making it cheap, tasty, and very safe. And of course, we can see the ocean again for the first time since leaving South Africa. Waking up at Horombo hut we were sore and although feeling much better than the day before, still physically exhausted. 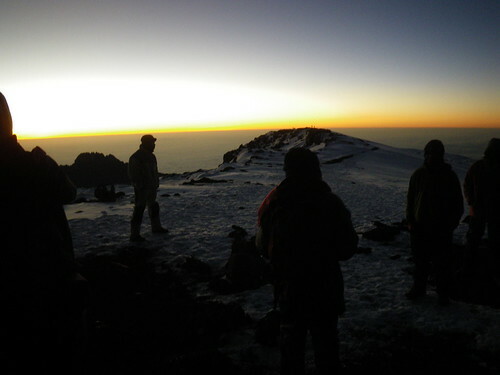 After summiting at 6:30 a.m. We hiked for another 7 hours back down to Kibo hut and finally to Horombo to spend the night. We ate breakfast and headed out ready to get off the mountain and down to lower altitude. Jubilant that we had all made it to the top, we headed down with whatever spring was left in our step covering the distance to Mandara huts in less than 3 hours. Leaving our friends to their lunch at the huts, we continued down the path for another hour to a little lunch spot along the trail. Emerging from the woods to what we thought was a secluded picnic site, we were surprised to see several groups of porters waiting in the shade. Tucking into our lunch, we ate quickly, ready for the journey to be over. Rejoining our friends for the final hour and a half, we finally walked through the park gates, overjoyed that the walking was over. Our feet were tired, our legs worn out, but we were happy and looking up at the summit I could hardly believe that just a day ago we had been up there! Drinking a delicious ice cold soda, we relaxed a bit while our guide signed us off the trail and obtained our official summit certificates. Piling into our pick up truck, we headed down to the companies office to unload, unpack and wash up a bit. Again, it was hectic at the office, and by the time we sat down with our crew in the bar nearly an hour had passed since our arrival. Thanking them for their assistance and hard work, we shared a few drinks as our guides presented us with our certificates and we presented them with some tokens of appreciation. To congratulate us, our guide sang a song about Kilimanjaro in his local language, complete with dancing and clapping, which needless to say took us by surprise. The man who had been mostly silent the last week was suddenly full of life, jumping around and singing. Heading to Moshi in a combi that night, we were the talk of the bus with one man moving to the back of the bus just to sit next to me and practice his English. An hour later we were in town ready for a hot shower and a big comfortable bed. 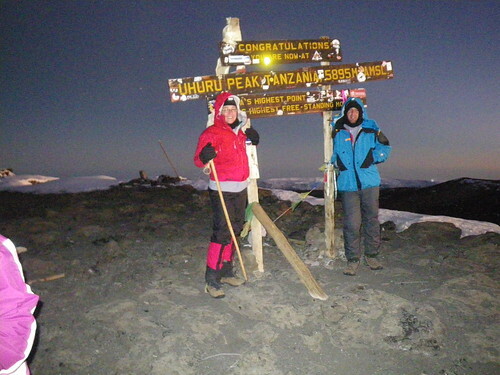 We had summited Kilimanjaro! Mt. Kilimanjaro- Day 5- Will we make it? As we left Kibo hut I turned to our new guide and asked what time it was. He checked his cell phone, which still had service at 4700m, and informed me that it was midnight on the dot. We were off, George setting the pace, and that was that. At first the pace was rather quick, leaving us out of breath, but soon we caught up to the group in front of us and George slowed us down, he just wanted to make sure we not begin our walk alone. Up we went, a combination of heaving breathing and slow walking. The pace was so slow it was nerve-wrecking but anytime we sped up in the slightest we were left struggling to catch our breath. We passed some people, others passed us, we were just part of a small string of headlamps you could see snaking up the slope of the crater. As we climbed higher the affects of the altitude took a greater toll. From the start I felt nauseous but as we climbed that discomfort ultimately transferred to my head, mild mountain sickness. One step in front of the other, we just kept climbing and climbing. We’re halfway to the top, George would tell us…then repeating that same sentence 40 minutes later. He played games like this the entire way up, the top never seeming as far away as his time estimates…thanks merely to the darkness and the fact that we couldn’t see how steep the climb was. Climbing over Gilman’s Point we could see the caldera of the crater for the first time. We’d climbed the volcano but we weren’t finished yet. With 200 additional meters to climb to the Uhuru peak the wind picked up, the temperature dropped, our energy levels plummeted, and the air continued to thin. At first it was actually a bit easier, with ground that was relatively flat from what we’d done. Soon the elevation began again and even though it was much smoother than the steep climb we’d already managed, it seemed nearly impossible. I’m not sure what it was, but at some point my body wanted to do everything a newborn baby does. Breath, sleep, eat, drink, poop, and pee. I could do none of these. I suppose I was breathing but no where near as much as I would have liked. It was the desire to sleep though that most took control. As I walked I began to count paces before resting and breathing, then I was counting breaths. Ten breaths walking, 2 resting, then 7 and 4, then 2 and 10. There was no system to these numbers but the rest breaks were as much about me leaning forward, resting my head on my walking stick, and shutting my eyes. I felt myself wanting to sleep. Jill knew I was struggling. So did both guides. At one point Coleman, behind me, carefully choosing his words as he barely spoke English, said to me that I must move faster or I’ll freeze. I knew he was right, but I wanted to sleep. We made it to the summit. Our friend had puked again. Others were delirious. We took our picture. The guide cut off the top of the sign, his fingers were numb as well. We took another picture, then another, finally we got one that was “good enough” and we started back down. While up there we had some tea, it was hot, didn’t bother to eat anything. It didn’t matter. 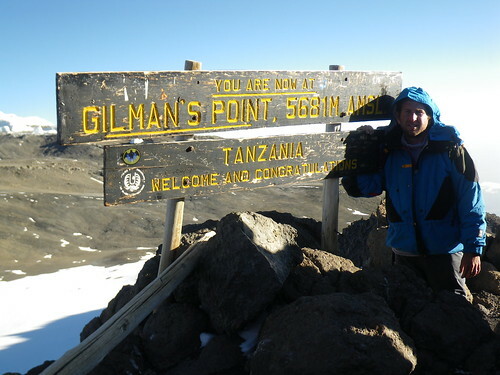 At 6:30am, on Thursday, March 11, 2010, 364 days after starting this trip, we stood atop Mount Kilimanjaro, the highest point in Africa and the world’s tallest freestanding mountain. After three easy days on the trail, day four was a killer. 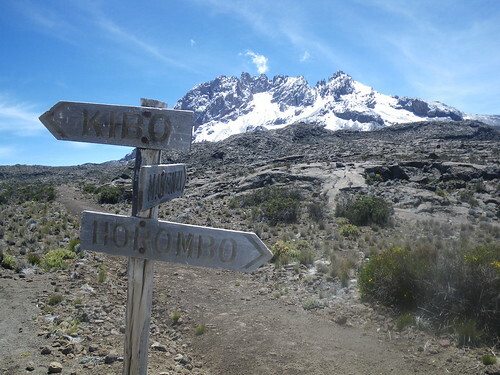 We took our time heading up to Kibo huts, knowing that if we made it to 4750m sick or feeling ill there was no way to make it to the summit the following morning. So we took our time and meandered our way up to Kibo. The trail itself was easy and although we gained nearly 1000m in altitude, and found ourselves at the end of the day in a relatively low oxygen environment, the hike itself wasn’t so hard. 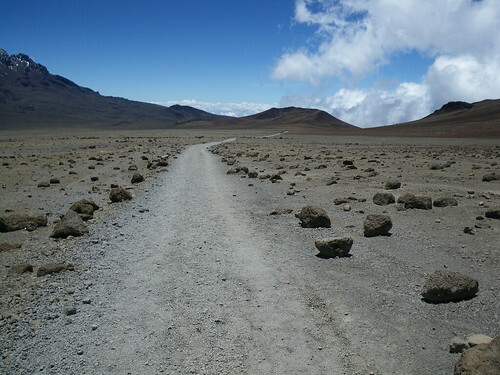 Unlike the hike to Horombo, the landscape to Kibo was basically desert. 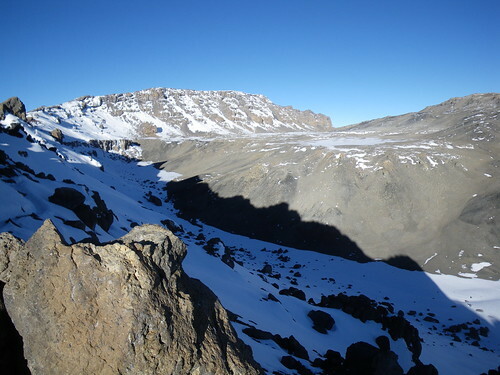 Very few plants live at that altitude near Kilimanjaro and within a few hours of leaving Horombo the landscape strongly resembled the alticama of Bolivia . Day four, for me, was a killer day because of the anticipation. All day on the way to Kibo hut we started at the summit of Kilimanjaro, hoping, waiting and anticipating what the final climb would be like. 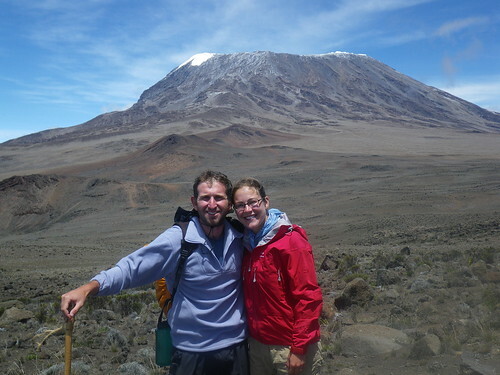 By the time we got to Kibo hut we were all excited and anxious to get to the summit. Doing well, with just a small altitude headache, we were prepared to rest up and get to the summit. Although we had been to 4750m in Peru , we didn’t really realize what spending hours at that altitude would be like on our bodies. Although the body is exhausted from hiking and even breathing at that altitude, its practically impossible to sleep the afternoon before the summit. We arrived at Kibo huts early in the afternoon and went immediately into our beds to rest a little before an early dinner. Cold, excited and anxious, we could hardly sleep and spent most of the afternoon laying in our sleeping bags chatting with the other 10 climbers in our dormitory. 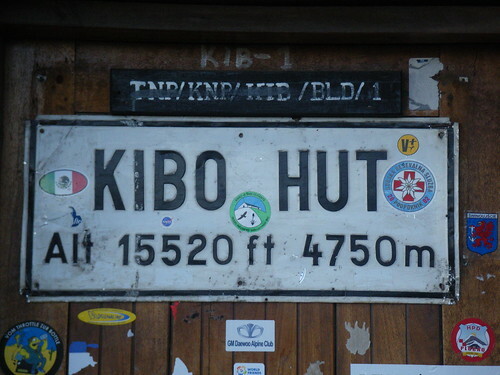 Kibo hut is not comfortable, unlike the other huts, it’s made from stone and trust me it’s cold and has a tense feel about it- everyone approaching the summit from that side of the mountain stays at Kibo hut the night before summiting so the atmosphere is friendly, but intense. Everyone wants to make it to the top. Unable to sleep well, we spent that afternoon and early evening resting- literally laying in our sleeping bags, drinking tea and eating what we could. After an early dinner, we crawled into our bags for a few hours of proper shut eye, which we didn’t really get, before getting up at midnight for the summit. As I lay there with my eyes closed I could feel my heart pounding in my chest. Altitude or excitement I’ll never know, but I was very aware of every breath and movement I made and all I really wanted to do was get to the summit and get down. 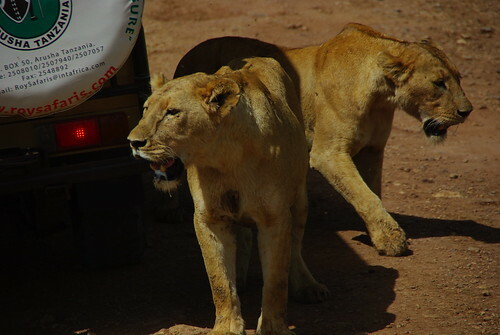 We woke up in the morning at the Horombo camp, 3700 meters in the air, without much to do that day. We were feeling pretty good so long as we ignored the fact that everyone in our room woke up at least three times in the night to go pee. The best part of the night time escapes were the stars. Above the clouds and the lights of the cities below we could see everything in the sky including plenty of shooting stars. I hoped we’d see plenty on our walk up to the summit. After breakfast we began our walk to zebra rock…a rock that looks like it has the stripes of a zebra. If that doesn’t sound too exciting to you its because it isn’t. The reason it was important was that we were using the “free” day to stretch our lungs and climb higher in altitude. For the first time since starting we were really feeling the altitude and it was making us walk slower and steadier. We climbed to zebra rock and then we, along with only two other climbers, continued further uphill toward the saddle trail…the stretch of land between Mt. Kilimanjaro and its sister peak, Mt. Mawenzi, climbing to somewhere around 4300 meters above sea level. From here we could not only see Mt Kilimanjaro clearly, but we could also see the seemingly vertical climb we’d have to make two days from now, sometime between midnight and 6 am, straight up the side of the volcano. We spent the rest of the day sitting in the dining hall, playing cards and psyching ourselves out for what was to come. We watched as nearby clouds displayed their lighting for us, at eye level, and made jokes as none of us could control our bladders. It was a rest day and that’s what we did. Despite the easy day we were still treated as though we were working hard. We were provided with hot water outside our hut in the morning and after our hike. We drank more tea than we could stomach. The meals were huge, all three of them, plus our snacks. We were preparing for a high altitude climb and were made to felt that way. Medical science dictates that above 2500m you are only to increase your altitude 300m per day…we were going way beyond that limit, which was OK because it was going to be a short trip up and then back down. Still though, we needed the rest and the nourishment to get ready.